Marvel's Mighty Thor teams up with the Incredible Hulk in a Little Golden Book just in time for Thor: Ragnorok which releases in theaters Fall 2017! This book also features the the villians Skurge and Grandmaster! 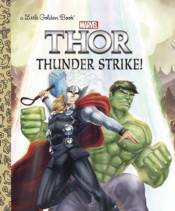 Little Golden Books are a great way to introduce boys and girls 2-5 to Thor and the other heroes in the Marvel Universe.